SINCE the last review of Dragon Hut restaurant was written back in June 2004, it was appropriate to revisit and see what new menu offerings the restaurant plans to roll out this month. 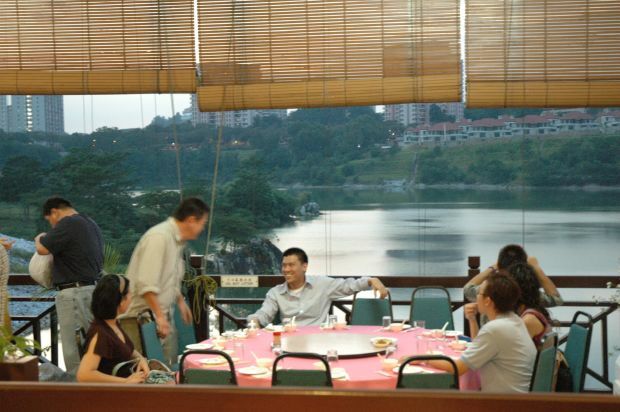 Dragon Hut, whose menu is non-halal, has been in business for the past 10 years since opening in 2002. the concept is one of open-air dining, and diners have a nice view of the artificial lake next to the establishment. The restaurant caters to locals, especially residents in nearby Taman Desa as well as Japanese and Chinese tourists. The first new offering on the menu was Claypot Coral Trout, at RM58 per order. The fish is seasoned with ginger, salt and sugar and more importantly, Huatiao wine, then left to cook for a while before being served. This simple style allows diners to get the subtle taste of the white flesh without being totally drowned in its own broth, while the generous helping of Chinese celery adds a fragrant aroma and flavouring to the broth. The size of the next dish, prawns served Indonesian-style, is nothing to be sniffed at. At RM12 per 100gm (minimum of 300gm an order), we are talking about large prawns swimming in a claypot of rich curry alongside ladies’ fingers, brinjal and onions. Some may find it a little spicy, but personally, I found it just right. Between the fresh prawns and the rich gravy, one probably needs a lot of willpower to refrain from asking for another bowl of rice. Sotong (squid) fritters may sound innocent enough. But after leaving the chopping board, the squid is coated in a coating of seaweed and crushed crackers, and intriguingly, Twisties, Cheezels and Shichimi togarashi (the chilli powder commonly found at Japanese restaurants). The dish comes in servings of RM12, RM20 and RM35. While I tend to prefer beancurd prepared simply, Dragon Hut’s version has been rolled in a coating of self-raising flour, some starch, fine salt, galangal powder (sha jiang fen) and Chinese five-spice powder. 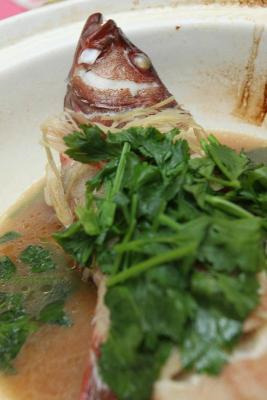 Fresh and healthy: The coral trout, steamed in alight broth of Hua tiao wine, ginger and flavourings, with a generous helping of Chinese celery leaves, is probably the best way to go for a simple and fresh dish. These are then fried to give the tongue a tingle, before biting into the plain beancurd taste. An interesting diversion if one is tired of the plain soy sauce or minced-meat routine which generally accompanies beancurd dishes. One serving goes for RM8. Meat lovers need not despair as Dragon Hut has also prepared one pork spare rib dish and a traditional Hokkien spring-roll dish. The spare ribs are doused in a home-made sauce, which aside from barbecue sauce, also has red wine reduction, orange juice and concentrate and some rock sugar thrown in for added taste. The end result is both tangy and slightly sweet. The whole dish works best when you eat the rib and sauce together with the garnishing of julienned onions and bell peppers. Each rib goes for RM6, with a minimum order of four ribs. For the Hokkien spring-rolls, Dragon Hut manager Cecilia Yap told us that the dish was something suggested by her father. Instead of the usual starch or flour wrappings, Chef Kam uses caul fat, literally translated in Mandarin as “pig net lard”, which isn’t actually fat, but the membrane around some animals’ gastro-intestinal organs. This substance is used to wrap the filling of minced pork, fried garlic and onions. The whole roll is rolled in egg and light flour, then deep-fried. While the wrapping is interesting, I personally felt that the dish is probably just “adequate” compared to the rest of the new offerings. The size of each roll is quite filling though, and is priced at RM5 apiece, for a minimum order of two rolls. > DRAGON HUT RESTAURANT, Lot 9291, 4107, 16010 and 5735, Taman Danau Desa (next to Desa Waterpark), Old Klang Road, Kuala Lumpur Malaysia. Tel: 03-7118 2626. The restaurant is open daily for lunch and dinner, from noon till 2.30pm and 6pm till 10.30pm respectively. Non-halal.